So What Are Facebook Lead Ads? How To Set Up A Facebook Lead Ad? Right now you can only create Facebook Lead Ads through Power Editor. If you do not see Lead Generation as an ad objective on Power Editor, please reset it. To do so, go to Power Editor. On the Help menu located on the top right corner, select “Reset Power Editor”. Click “+Create Campaign” and enter a campaign name. Must keep the buying type as Auction. Under Objective, select Lead Generation. Create a new ad set and enter an ad set name. At the ad set level, select the Facebook Page you’re advertising with. A Terms Of Service Agreement will be prompted, which you must read and accept the terms before you can continue. Select Budget, Schedule, Audience, Placement, Optimizing & Pricing and Delivery Type. Please note that you cannot target lead ads to people under the age of 18. Create a new ad and enter an ad name. Select Your Facebook Page, fill out ad creative section, and set up conversion tracking. A Form Option window will be prompted, select “Create New Form”. If you have created lead forms before, you can duplicate existing ones and make changes. Click Next. Name your form and select a language for your form. Please make sure to select the language your target audience will view your form in. Click Next. Under “What Information Would You Like To Ask For”, you’ll see Full Name and Email Address checked by default. Click “Show more options” if you want to ask for more information. You can also ask up to 3 additional questions by clicking on “+Add A Question”. There are standard ones that you can choose from based on your niche or create a custom question from scratch. When you’re done, click Next. Enter a website URL you want people to go after they have completed your form. Click Next. You may choose to add a Marketing Message to your form. You can use this to provide more information about your product or service, which will be displayed to your audience before they start filling out the form. If you decide to add one, click on “Add Marketing Message”. However, we do not recommend this as this creates an extra step and added friction for people to complete the form. This is something that you might want to test out! Enter marketing message and click Next. Preview form to see if you need to make any final changes. Then click “Create Form”. Click “Upload Changes” at the top of Power Editor to submit your campaign for approval. Once a user submits the lead form to you, you are able to download it immediately. To do so, you will have to be a Page admin or a Page advertiser. Click “Lead Ads Forms”. Please note that you are only able to see this section when you have created a leads ad campaign. Select the form you wish to download and export the leads in a CSV format. It is ideal for you to download the form multiple times a day so that you can follow-up with the customers as quickly as possible especially if you are collecting requests for quotes or business information. However, this method is time-consuming. On top of that, if you have a CRM system in which you want to add the leads in, you will have to do it manually. This is why my partners and I created LeadsTunnel. A simple to use, cloud-based tool that directly synchronizes your Facebook Leads and connects you to over 20 different popular autoresponders, CRM’s and webinar platforms of your choice in REAL-TIME! This will take all the grunt work out and automate the entire process so that you can have all the leads in your database and follow-up with your prospects in a timely manner! We designed LeadsTunnel with privacy in mind so be rest assured that none of your collected data will be stored. It is your data and your data only. What’s more, is that you are allow to connect your data to multiple platforms at once. There’s no exporting or transferring needed. It’s simple, fast, and secured! So let’s talk about how you can use LeadsTunnel and Facebook to build your list. The minute that someone sees your Facebook ad and clicks “SIGN UP” – they’re AUTOMATICALLY and INSTANTLY sent to one or multiple autoresponders, CRM’s and webinar platforms of your choice. They are instantly subscribed to your email list and they will get an email from you! You can immediately begin to build a profitable relationship with your new subscriber! LeadsTunnel is 100% cloud hosted for you, nothing to install, just a few buttons to click and you’re ready to go! LeadsTunnel is a next generation technology that puts the power of Facebook AND list building right at your finger tips. Heck, you can even start selling your high-ticket programs using Webinars – directly off of Facebook! Remember, you also don’t need to worry about any compliance issues. You have no landing page and hence, you can stop waking up every morning in sweats about whether Facebook shut down your account or not. Using LeadsTunnel you can now 100% automate building your List using this new form of advertising on Facebook! 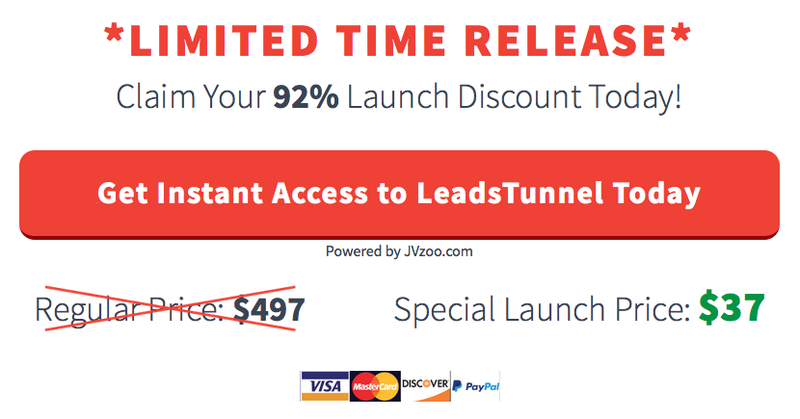 3) LeadsTunnel automatically adds the Lead to your autoresponder or webinar software. It is really that simple. Grab your copy now! You’ll be amazed. It is a total game-changer if you want to reap the benefits of Facebook Lead Ads without doing the tedious grunt work afterwards.